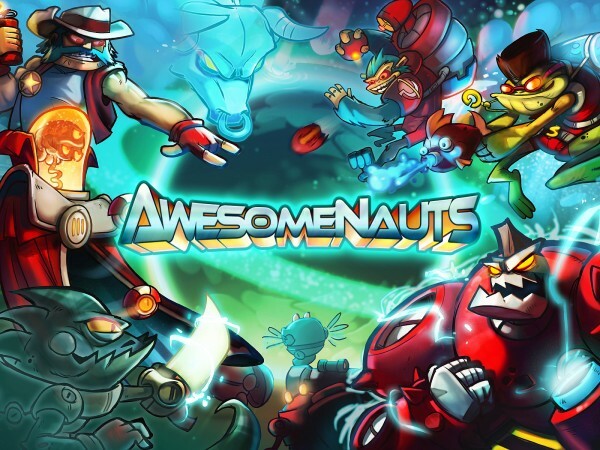 Pick up and play – Awesomenauts is a game of depth, but foremost a game that’s quick to pick up. Each character has an attack, a jump, and two skills; that’s not much to digest. With the character so easy to understand, actually learning the game is as simple as the back and forth of combat. As enemies approach your tower, it shoots them, same for theirs when you advance. Every time an enemy dies, gold and silver cubes drop from monsters and add to a money value at the bottom of the screen. Every element of the game is clear, there’s no clutter. Dodge and counter – Each hero in Awesomenauts is a little different, but they all have a very perceptible presence on the battlefield. When Clunk comes lumbering into battle, exploding and snaring as he pleases, enemies keep their distance, taking potshots and implementing a hit-and-run combat style. As Leon lurks in the shadows, Yuri places bombs all around him to keep the cheese-loving assassin at bay. Battle is frenetic, dodging shots, escaping deadly ambushes and turning the tables on an unsuspecting enemy forms the quality of second-to-second gameplay that the best competitive games are made of. Respond and adapt – A constant assessment of the enemy’s ability to win versus your own isn’t just a passive observation. In Awesomenauts you don’t have to sit back and watch the enemy team steam roll you, there’s almost always something to be done with a competent build. 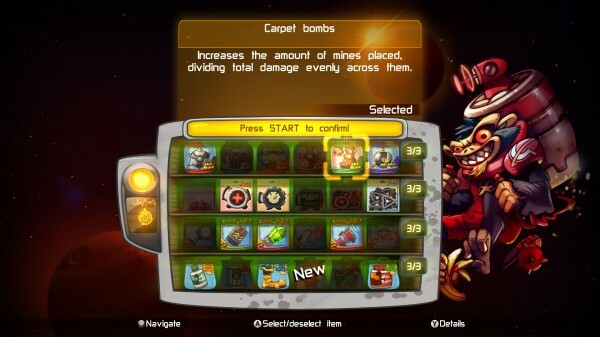 The loadout system allows for players to bring different upgrades into the game, during which they can pick and choose based on what they need. If Yuri’s team is dying, he can build support, but if they need to push more, he can focus on his bombs and laser power. This versatility not only makes playing the one character varied from match to match, it makes for excellent on-the-fly strategic decisions. 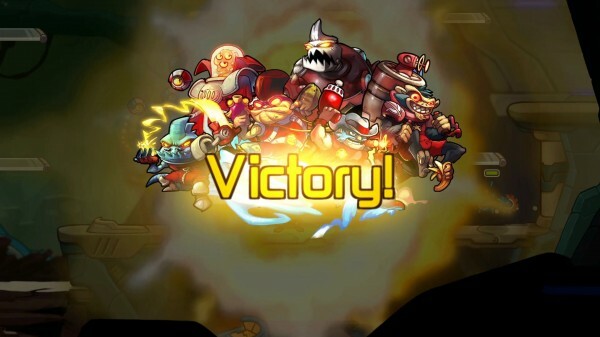 Strategize and dominate – Awesomenauts only has one mode, so it’s always three versus three, but the maps are completely random. Of the three available maps, the early and late game strategies that work best are vastly different. Almost any combination of three heroes can be built to work together, but the enemy team must also be taken into account. The goal of the team at the beginning of the match almost always shifts mid-game as the enemy pushes harder than expected, or is being way more defensive. Building and moving your characters around the battlefield requires an active role in strategizing. 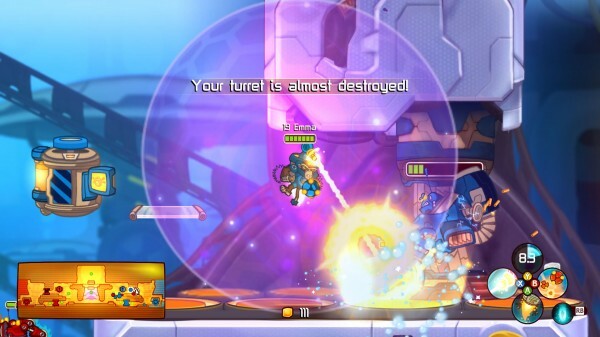 In Awesomenauts, the brain gets to have fun too, not just the thumbs. 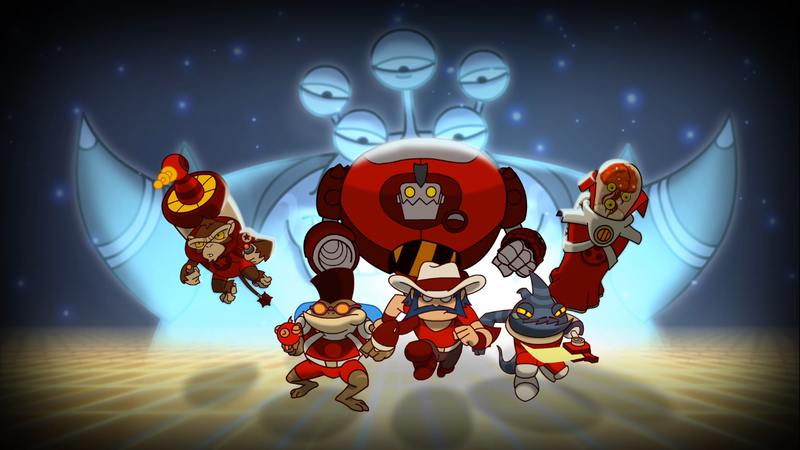 Bold and crisp – While playing this game where an onlooker told me this specifically “It’s amazing how good 2D games look these days, everything is just so damn crisp!” Awesomenauts features some of the cleanest, most attention-grabbing hand-drawn visuals in a 2D game to date (up there with Skullgirls). This is due in part to Ronimo’s decision to forgo the traditional dark fantasy theme of many MOBA games in favor of an 80s cartoon style and presentation. The theme is palpable, even without a nostalgic love of 80s cartoons. Disconnect and derail – Since this game is entirely devoted to being a competitive multiplayer experience, everyone has to smash into each other via the internet. Unfortunately, while the drop-in drop-out multiplayer is seamless, and finding matches is painless thanks to the bot system, players will sporadically disconnect from each other for absolutely no reason. In rare occasions players will be booted to the main menu and lose their progress in the match they were in. This doesn’t happen to everyone (it’s never happened to me personally) but it’s worth noting. Bots and AI – The bots, while generally a welcome feature of the game, are a bit predictable after hours of play. Each bot builds the exact same way in the exact same order every time, and Yuri and Voltar bots don’t seem to exist. The bots also don’t use the teleport back to base function, so it takes a slow character like Clunk forever to return to the shop. This results in Clunk-bot often being under leveled. On the contrary, Froggy G and Lonestar are excellent bots. Bots are nice, but long-term they’re no substitute for humans. Awesomenauts does exactly one thing well, but that one thing is so incredibly rarely achieved: it’s a fun competitive party game. Learning the game is quick and simple, but mastering it will take hours and hours. There isn’t a ridiculous amount of content, but there’s so much to do with it that there’s still room for people to hate things others love and be perfectly justified in their preferences. 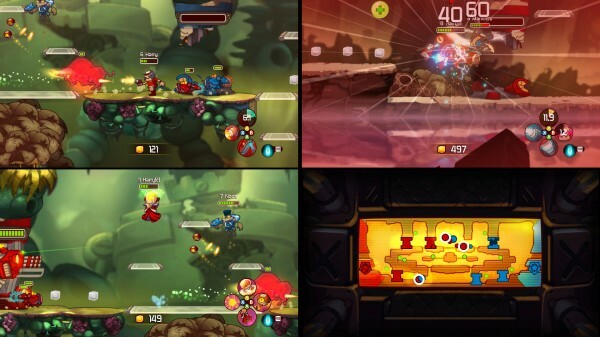 Three player splitscreen, an amazing soundtrack and visual presentation solidify Awesomenauts‘ role as a fun-petitive game.